Wing span: 1 3/4 - 2 5/16 inches (4.5 - 6 cm). Identification: Tails are long. 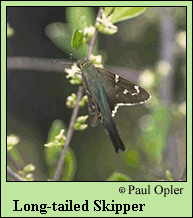 Upperside is dark blackish brown; body and wing bases are iridescent blue-green. Males have a costal fold enclosing scent scales on the leading edge of the forewing. Dark row on underside of hindwing is a complete band. Life history: Adults roost upside down under leaves and limbs. To seek females, males perch 3-6 feet above the ground in sunlit openings. Females lay eggs under leaves in clusters of up to 20. Caterpillars feed on leaves and live in shelters of rolled leaves. Flight: Two to three broods throughout the year in south Florida and South Texas. Caterpillar hosts: Vine legumes including various beans (Phaseolus), hog peanuts (Amphicarpa bracteata), beggar's ticks (Desmodium), blue peas (Clitoria), and wisteria (Wisteria). Adult food: Flower nectar from a variety of plants including bougainvillea, lantana, and shepherd's needle. Habitat: Brushy fields, edges of woods, gardens, and other disturbed open habitats. Range: Argentina north through Central America, the West Indies, and Mexico to peninsular Florida and South Texas. Occasionally strays and colonizes north to Connecticut, southern Illinois, eastern Kansas, southern Arizona, and southern California. Management needs: Urbanus proteus caterpillars are sometimes pests on snap beans.